1. 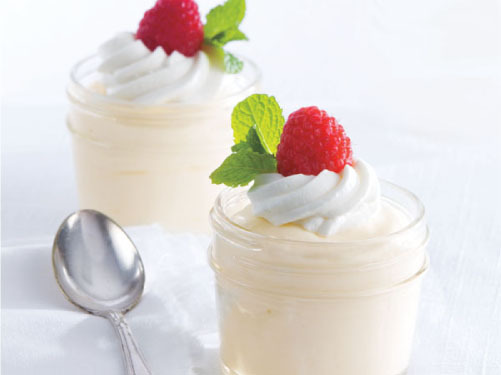 Prepare Lemon Curd: In medium bowl, whisk together eggs, sugar and lemon zest until light and fluffy. In medium saucepan, heat butter and lemon juice to boiling over medium-high heat; remove from heat. To temper egg mixture, transfer 1/3 cup of the hot butter mixture into egg mixture while whisking constantly; add butter-egg mixture back to saucepan. Heat mixture to boiling over medium heat, whisking constantly. Cook 2 minutes or until large bubbles appear and mixture thickens; remove from heat. Transfer lemon curd to large bowl; cover surface with plastic and refrigerate at least 6 hours or overnight. 2.Prepare Whipped Cream: In large bowl, with mixer on low speed, beat cream, powdered sugar and vanilla 2 minutes. Increase speed to medium-high; beat 4 minutes or until medium-firm peaks form. Reserve 1-1/2 cups whipped cream for garnish. 3.With rubber spatula, fold half of the remaining whipped cream into lemon curd until combined; fold in remaining whipped cream. Evenly divide mousse into jars. Garnish with reserved whipped cream; top with berries and mint, if desired. Serve or refrigerate up to 4 hours.